I have meant to post this for over a week now but apparently I was too busy reading about the cold. 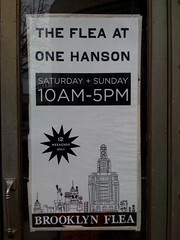 Last weekend Telfer, Eleanor, Cate and I went to the Brooklyn Flea. I love a good flea market or yard sale. And this one had food. Even better. 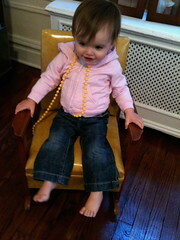 A 60s-style vinyl rocker for Cate. 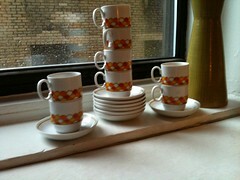 8 cups and saucers with a retro feel. 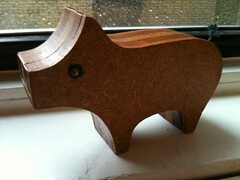 And then finally, Telfer's pig. He fell in love with it and I couldn't break his heart. And then the food. 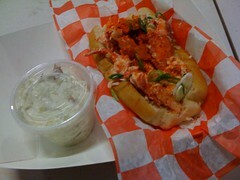 I could eat a lobster roll every day. And cupcakes, especially little maple cupcakes with bacon on top of the frosting. Really. I can't believe I forgot to take a picture. Previous Post Cate’s Favorite Things. Next Post January is over and yet. Telfer posted a picture on FB of your flea market finds — and I told him it would be a “must-see” when Anna and I come into town. Can’t wait! I think that could be arranged 🙂 – warning – anna is dangerous shopping with me. You guys will be lugging home a set of china or a punch bowl!